There will be a Q & A session after the film led by Joan Porter MacIver, BISI Council member and HCUK past president with a reception. 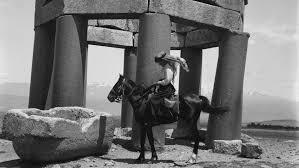 Gertrude Bell was a pioneering English writer, archaeologist, diplomat and spy whose travels through the Arabian desert gave her local knowledge unparalleled by her British peers. Recruited by British Military Intelligence after World War I, she played a significant – often unrecognised – role in British imperial policy-making in the Middle East, notably Iraq. Openly critical of colonial practices, Bell’s insights are a singular, prescient prism through which to understand both the Middle East and the all-male inner sanctum of British colonial power. Reflecting on the life, work and character of this remarkable woman, Oelbaum and Krayenbühl weave together a rich tapestry of fascinating archive alongside Bell’s writings, letters to her parents voiced by Tilda Swinton, and testimony from peers including TE Lawrence and Vita Sackville-West. Though writing a century ago, the acute contemporary relevance of Bell’s words is astonishing – at times even chilling.